Marja Salaspuro, Amsterdam — No discussion, No tolerance, No Smudge in the Clean Image of Helsinki. Zero tolerance towards graffiti includes a strong resistance against an open discussion around what is allowed in the public space. Last week in Helsinki, a celebration of the Anti-Smudge project gathered as a counterpart, a public demonstration demanding legal graffiti painting places. The battle was ready, several participants of the demonstration got arrested, newspapers were filled with discourse of war. 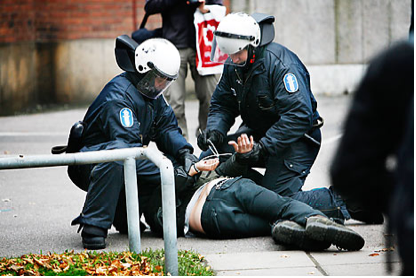 To be honest, I don’t care who is right and who is wrong (I guess nobody is perfect), but I want to spread a dream of more open discussion around what is allowed in the streets of Helsinki. Yesterday I found from my unloaded moving box following post card. It is presenting Slovenian artist Igor Stomajers project called ‘Foreign’. Foreign was displaying current verdicts about the different countries and was especially emphasizing the stereotypical division between East and West Europe. In Stomajers’ art work, the hierarchical division between the East and West changes once you try to read the sentences. The words tumble and meanings become interchangeable, just like in the current Graffiti/War discourse in Helsinki. There is a need to break stereotypes between ‘East’ and its scrawling subcultures and ‘West’ the Public Work Department of Helsinki city. In the end, a discussion about what visual elements are allowed in the urban public space should be an ongoing dialogue following the changing needs of the citizens and done in a manner which respects diversity and freedom of expression. Unfortunately, tolerance towards more diversified street communication is zero. 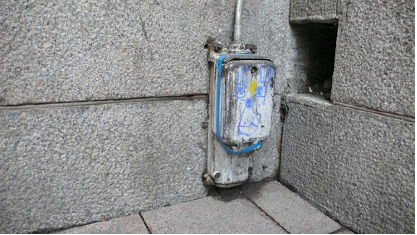 For those who are not aware, an Anti-Smudge Campaign has been in charge of Helsinki’s effective cleaning process towards all kinds of unauthorized street communication in the public spaces. The definition of ‘SMUDGE’ includes graffiti paintings, posters, stickers and basically anything added in the urban public space. The zero tolerance means that there are no legal graffiti painting places and even ordered paintings have been eventually removed. The project has been going on for 10 years, but effective cleaning hasn’t stopped the dream of more open discussion around what is allowed in public space as this weeks demonstration showed. On Tuesday the ‘invitation only’ event in Finlandia Hall gathered Clean Image supporters for celebrating 10 years success of Anti-Smudge campaign. According to their statistics: in 1998 there were in excess of 67.000 smudges or graffiti in Helsinki, while last year the figure was a mere 5771. The ‘invitation only’ event meant also effective gatekeeping. The reporters were kept out. According to Helsingin Sanomat, a national daily, even two Helsinki city councilors Paavo Arhinmäki (left party) and Kimmo Helistö (green), were evicted to enter the event. Not to mention that possible contradictory voices such as Youth Department was not invited neither. Not everybody are convinced about the efficiency of zero tolerance policy (neither that Anti-Smudge has proved anything else that cleaning is done effectively). In fact, the demand for neutral non-aligned research around Anti-Smudge Campaign was even headlined in the main national daily newspaper. Around 500 people took part in a “Smudge Fest” public demonstration, which was organised as a counterblast against the Anti-Smudge campaigns’ Anniversary celebration. The demonstrators were gathering around Kiasma Museum of Contemporary Art to demand legal graffiti painting places. By nine o’clock in the evening, the police had apprehended 27 demonstrators for throwing bottles, vandalising police vehicles, and spray-painting shop windows. Afterwards the City is pressing charges for 1500 new smears which appeared during the chaotic “Smudge Fest” demonstration. Meanwhile demonstrators are accusing police force for being too rough, and the newspapers headlines emphasize emphasize ‘war’ position. How about some tolerance and understanding? This blog post is an open invitation to explore more tolerant ways to approach the battle around visual street communication in Finland (and everywhere). Actually stickers have already taken room from paintings. If you have seen some incredible projects that were celebrating urban visual language, feel free to share. Helsinki needs new tools for expressing (legally) more diversified voices in the city space. Maybe creativity can be solution. At the moment in Amsterdam, there are several projects related to Graffiti as a part of urban play and more sophisticated methods (easier to ‘remove’ or temporary by nature). Two of them are presented as a part of the Experimenta Design and Picnic cross media week. Outfitting graffiti artists with open source technologies.